If you have ever visited Boston, or planned to visit Boston, or thought about visiting Boston, the chances are that you have been told to visit the North End. The North End is the Italian center of Boston, being the home for many immigrants who made the journey to the New World starting in the 1860’s. The birth place of Pastene, Prince Pasta, and the Ponzi Scheme, the North End has an immensely interesting history beyond the amazing food and fabulous gourmet groceries that now dominate its streets. Now that you have some history, let’s get to the food. 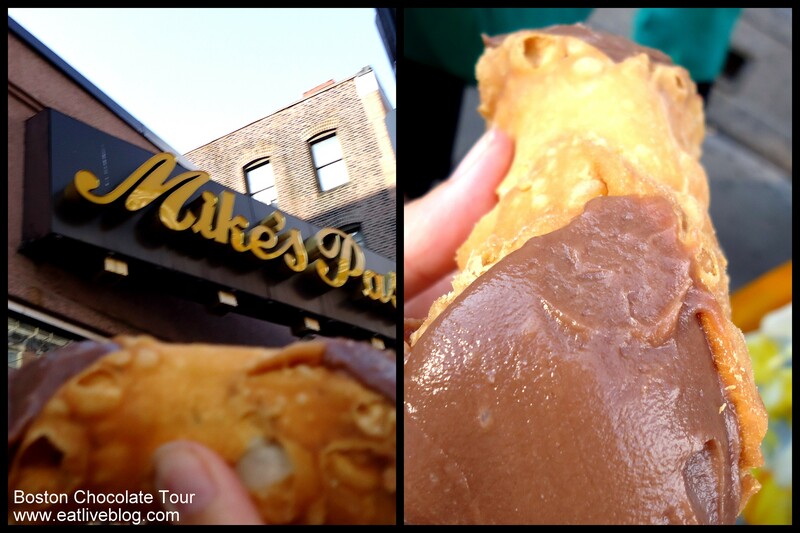 Surely amongst the North End recommendations you have received a direct order to get a cannoli from Mike’s Pastry. And if you didn’t, then you would notice the second you entered the North End that almost everyone is carrying one of their white twine covered boxes. But where do you coat your stomach with delicious pasta, sauces, wine and aromas first? For me, the answer to that question, every time, is Piccola Venezia. The first time we ended up at this ristorante was shortly after I moved to Boston. My mom and sister were in town, we had spent an entire day walking the city and were completely exhausted. Our day dumped us in the North End where we proceeded to try to find a wait of less than an hour for dinner. PV (we’re on abbreviation terms now) only had a 30 minute wait, and 2 seats at the bar. Our fate was sealed. A shot of frangelico for mom, and a bottle of Frascatti wine for the sis and I, and a new favorite restaurant was born! Everything I have ever ordered from PV has been right on point. Cold scungili salad, antipasto, arancini, sauteed mushrooms, gnocchi, lasagna, calamari fra diavlo, chicken al giovanni, chicken vittario, and risotto. It has all been amazing and has never been a let down. The service is warm and friendly. The atmosphere is cozy and relaxed. It really is everything you could ever hope for in a dinner in the North End. But here is the most exciting part of this post. 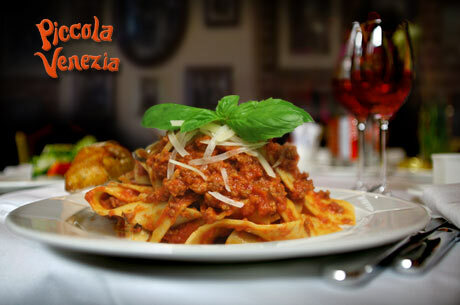 My friends at Eversave Boston are giving one of my readers a $30 voucher for Piccola Venezia! You must get your entry in by 11:59pm on Thursday, October 27, 2011. You can enter by completing one of the following. Make sure to leave a comment telling me which entry format you are doing. And if you don’t want to wait to see if you won, head on over to Eversave and purchase the $30 voucher for just $15! “Like” Eversave Boston on Facebook and comment on their Facebook page about the Eat.Live.Blog / Piccola Venezia contest. This entry was posted in Reviews by reneeh. Bookmark the permalink. Piccola Venezia is my favorite North End restaurant!! It’s the only place that does eggplant parm the way I like it. And your photo of the desserts is making me want one now! Ha! I know, it is an edible picture! So glad someone else shares my love for PV! Oh, how I love Mike’s. It doesn’t get better than the florentine cannoli. For dinner though, I love Assagio and Cantina Italiana. I know the Cantina looks a little cheesy, but they have really good gnocchi that you can get in a reasonable portion as a side, and this grape martini thing that rocks my socks off! For Boston in general, I really love Scholar’s in the Financial District/Downtown. Everything I’ve eaten there has been really great, and I love the atmosphere. You know I have never tried Scholar’s. I am going to have to get there! Well, I’m partial to Modern Pastry for their freshly filled cannolis with chocolate chips on the outside. We also like Maurizio’s (a little farther down Hanover), L’Osteria, and Monica’s. I have only been to a handful of restaurants in the North End but this spring I graduated from the School of Hospitality at BU and used to be the VP of a club called The Diner’s Club at the school. We set up a cooking class at Taranta with Chef Jose Duarte that was probably the best event we ever held. Everything from handmade mozzarella lessons to homemade ravioli lessons. Super cool, super yummy. Love the North End, but my favorite Boston restaurant is actually in the South End…Addis Red Sea. Incredible atmosphere and amazing Ethiopian food. Italian food’s not the only way to have a romantic night out! Ack! I don’t have a favorite restaurant in Boston YET! I’m trying to rack my brain and OM is coming to mind!! I don’t have a favorite restaurant in the North End seeing as all that I’ve been to( except one horrible experience at Nebo) have been great. But the most memorable was Carmen but that might have to do with it being my anniversary. i just tweeted, great giveaway! living in the NE for 3 years, I walk by every day and have never been here!!!! a travesty. But I love seeing the other commenters favorites. I’m a big fan of rabia’s, mamma maria, taranta, antico forno, Carmen’s…..let’s just stop there before I get carried away!